Heat water in a vessel, allow it to boil. Take a seperate vessel filled with cold water. Remove the stems from each tomato. Make a shallow cut in the shape of an x on the bottom of each tomato with a knife. 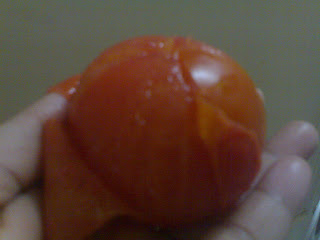 Drop the tomatoes in water and boil for about a minute; once the skin starts to peel back, they are ready. (Don't overcook them). Now you can easily remove the skin from the tomatoes.